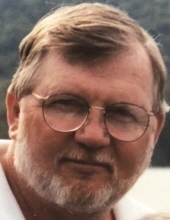 Dennis Rodgers, a longtime area resident, and retired engineer inspector, died unexpectedly at Orange Regional Medical Center on Saturday, January 26, 2019. He was 72 years old. One of five children, he was born to Robert and Gertrude Wardwell Rodgers on June 13, 1946 in Stoneham, Massachusetts. Denny served in the Army and then the Army National Guard during the Viet Nam War. He attended Penn State University where he met the love of his life, Jayne Kash. They married on December 14, 1968 in Spring City, Pennsylvania, and celebrated 50 years of marriage last December.with a surprise celebration given by his dedicated therapy team at the Acute Rehab Unit in ORMC. His employment as an engineering inspector was for Gannett Fleming Inc. in Pennsylvania. Denny was a quiet man of few words, who loved the outdoors, fishing, golf, bike-riding, sailing and kayaking, or just hanging out with his family. This gentle giant was beloved by all and will be missed by family and friends who benefited from his wisdom, wit and loyalty. Dennis is survived by his mother, Gertrude, his devoted wife, Jayne, his loving son Chris, daughter-in-law, Melissa and his cherished granddaughter, Samantha; brothers, Robert and Kenneth, sisters; Marilyn Steele (Gene) and Linda Rhine, and many nieces and nephews. The family is very grateful to the many staff members and therapists at Good Samaritan Home Care and ORMC hospital and Acute Rehab Unit who diligently cared for Dennis. Visitation will take place on Friday, February 1 from 3 to 6 P.M. at Applebee-McPhillips Funeral Home, 130 Highland Avenue, Middletown, New York. In lieu of flowers, please make donations in Dennis' name to the Michael J. Fox Foundation. To send flowers or a remembrance gift to the family of Dennis Rodgers, please visit our Tribute Store. "Email Address" would like to share the life celebration of Dennis Rodgers. Click on the "link" to go to share a favorite memory or leave a condolence message for the family.